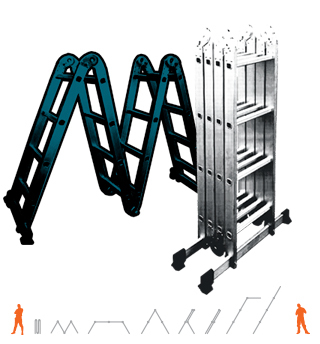 PWR WORK® Light, adaptable and portable ladder. Goes from 95 cm to 335 cm. Easy to transport and store. • Made of aluminium . • Stabilising bars with non-slip wedges. • 4 sections of 95cm with 3 steps each. • Extended ladder mode: approx. 335cm high. • Stepplader mode: approx. 162cm high. • Bridge-shaped ladder mode: approx. 90cm high.